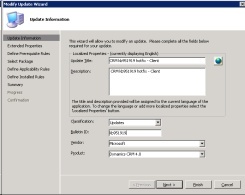 CRM provides a way for updating clients using its own update manager however this requires your users to have admin rights on there computers. 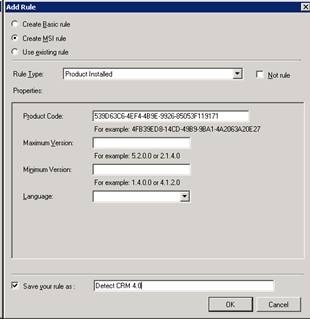 This situation is far from ideal so I have found a way to publish CRM 4.0 hotfixes using SCCM and SCUP. 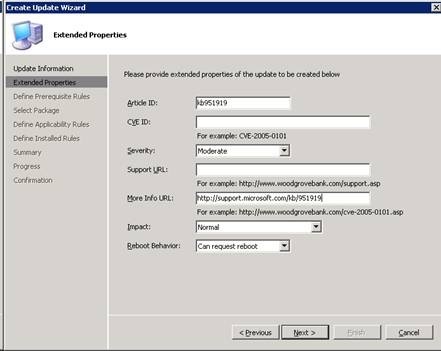 This guide will take you through the steps to get CRM hotfixes available for deployment via SCCM. It assumes that you already have SCUP installed and configured to look at the same WSUS server that SCCM is using. 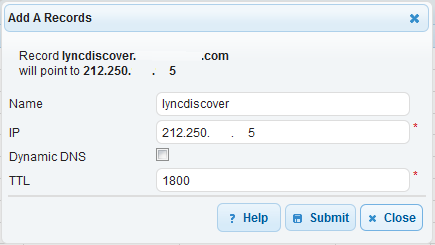 It also does not cover the process of deploying the hotfixes from SCCM when they appear in the list. 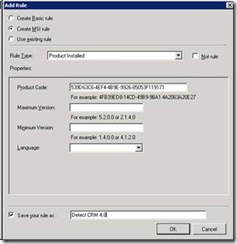 In order to install the patch you will need to get some basic information about the patch (its GUID) so that SCCM can figure out if the patch has already been installed on the computer already. To get the correct silent install switches from the patch run it with a command of /? (patch.exe /?) and make a note of the switches you want to use. 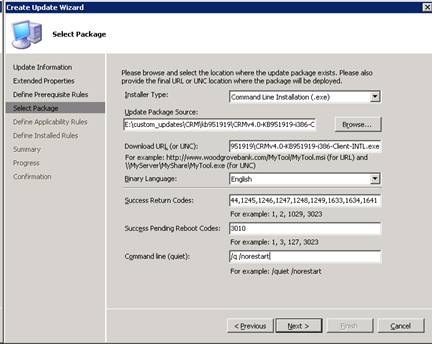 Now we need to get the files ready on the server and then start the “Update wizard” so copy the patch to a shared location (In my case \\server\custom_updates\crm\kb951919) and start up SCUP. 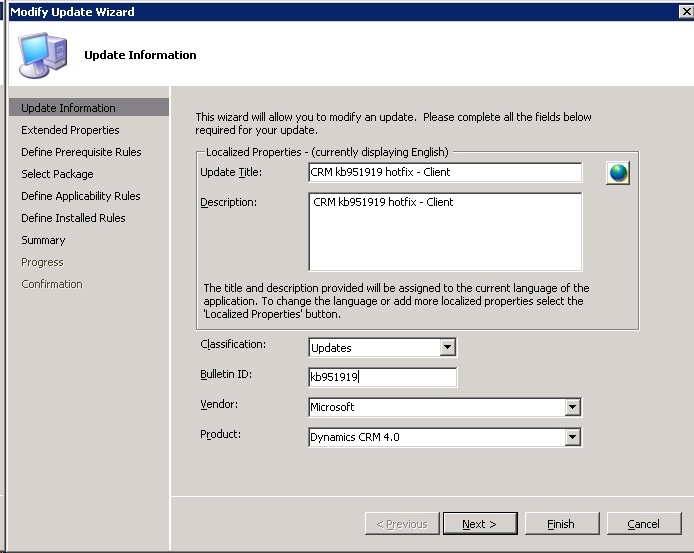 Fill in the information on the first screen and make sure to classify the hotfix as an “update” SCCM does not like displaying hotfixes for some reason. 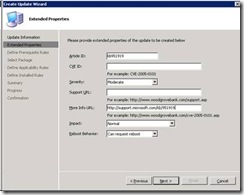 On the “prerequisite rules” I leave blank but you could specify that at a minimum OS of XP and that the computer is a workstation etc… These rules just help SCCM figure out in a broad sweep which machines to not even bother checking the update against. 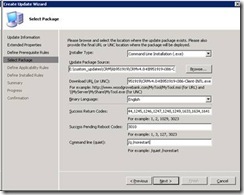 On the “select package” screen pick “command line installation (.exe)” as the installer type. 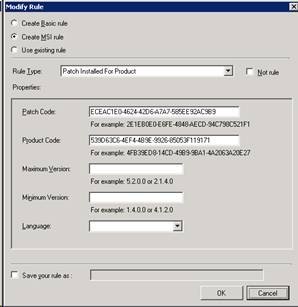 Move on to the next screen for “installed rules” and create a new rule as above but this time pick “Patch Installed For Product”. 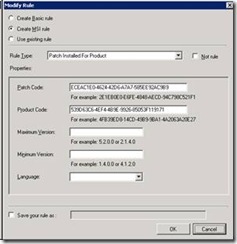 Enter the Patch Code that you wrote down earlier in the correct field and then fill in the Product Code as in the previous step. The update should now appear in your update list. Click the Publish flag and then pick “Publish Updates” from the action menu. The updates should now appear in SCCM when it next synchronizes and be available for deployment to client computers. Thanks for a great post. Still valid for the newer updates to CRM 4. 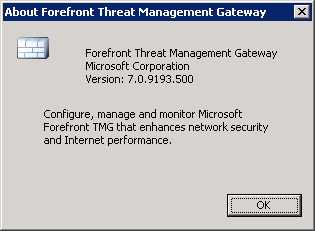 A question: Why not use the MSP instead of the exe? Then you don’t have to create the MSI-rules. 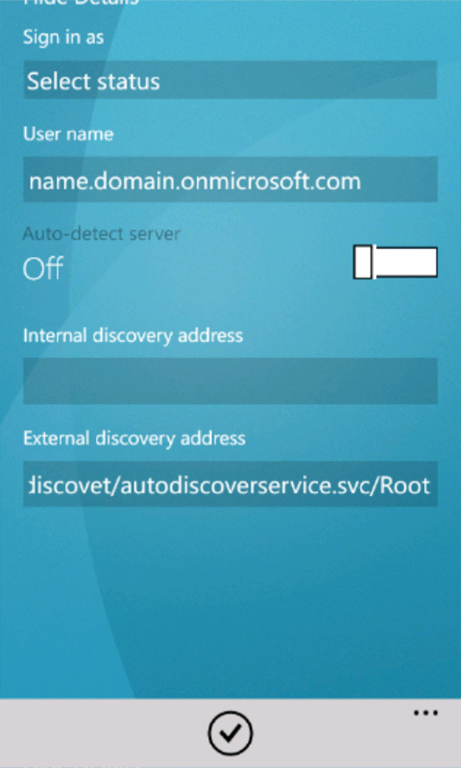 I managed to get it published von the SCCM-Server but if client tries to install it it failes…exit code = -2147023293.